Can you identify drug paraphernalia? Use of drugs usually requires some kind of equipment to get the drug into the body. This equipment is known as drug paraphernalia. It can be as simple as a rolled up banknote or as complex as spoons, scales, hypodermics and lighters. Other things which may come under the heading of paraphernalia are clothing with hidden drug compartments and drug logos. Here are the main ways drugs are introduced into the body. Snorting. As the mucus membranes of the nose lining provide a quick access route to the body, many drugs are sniffed or snorted. These are in the form of a powder such as with methamphetamine and cocaine. Drugs which are produced in crystal form are often crushed, for example with a credit card, before they are used. 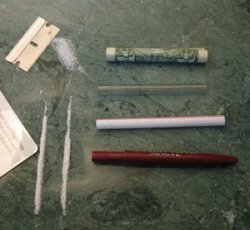 The powder is lined up on a mirror or any flat surface, formed into a line with a card or razor blade, and then sniffed through any type of tube such as a rolled up banknote, cut up drinking straw or plastic pen case. The powder often causes severe stinging and irritation of the nose and eventually results in damage to the cartilage. Injecting. For drugs that can be dissolved in water such as heroin, they are drawn up into a hypodermic syringe and injected usually into a vein but sometimes into a muscle or under the skin. 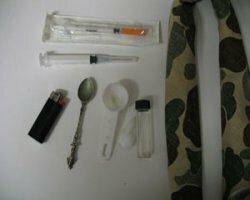 Drug paraphernalia for a heroin user will most often contain a small spoon or bit of kitchen foil, a vial of water, a tuft of cotton to act as a filter, the heroin powder, and a lighter. The heroin is measured into the spoon and water added. It is heated with a lighter to dissolve the heroin, and then drawn up through the cotton into the syringe and injected. Needle marks may often be seen on the arms and legs of a user, and eventually the veins break down and become useless. As the use progresses, the user has to find more and more veins until eventually they resort to veins in their necks, toes, fingers or anywhere they can get in. Some drugs, meth for example, can be used in many different ways including simply adding to food or drink so no actual drug paraphernalia is needed. Coffee is an option as it helps to mask the bitter taste. Injected it is prepared much the same way as heroin above except that it does not need to be heated to dissolve, as it is water soluble. Some liquids such as LSD are dripped onto blotting paper and eaten. Smoking. Drugs which are smoked can also be used in various ways. Marijuana can be rolled as a cigarette and smoked (known as a joint) or it can be packed into the middle of a cigar which has been hollowed out and this is known as a blunt. Pipes are a common way of smoking marijuana and are legally sold as 'tobacco' pipes and not drug paraphernalia. Small metal filters sold for sink faucets are often used as a filter inside a pipe. A bong, which is type of pipe filled with water is also another common way to smoke marijuana. Bongs are sold as being for tobacco use only. Various things are used to hold the last part of a marijuana joint. Sometimes tweezers or surgical forceps, or a small metal electric clip with some kind of heat proof handle is used. Cigarettes can be dipped into various substances such as PCP and smoked. Other drugs come in crystal form and have to be heated to a high temperature to release fumes which are then inhaled. Crystal meth and crack cocaine can be smoked in this way using a glass pipe. A glass pipe can be as simple as a glass tube with one end sealed leaving a small air hole, or as complex as a hand-blown glass pipe often in an array of colors, made for smoking. The crystals are dropped into the bottom of the tube, heat applied and the fumes inhaled. Pieces of a copper scouring pad are used to rest the crystal on, inside the pipe. Huffing or inhaling of a chemical can be done from bits of rag soaked in the chemical. Aerosol cans of whipped cream are used for the nitrous oxide they contain, or this gas can also be inhaled from a balloon or from a cut off soda bottle or disposable cup. Rave paraphernalia. MDMA otherwise known as ecstasy enhances all the senses. Menthol chest rub is used to enhance breathing and it may be used inside a disposable mask. Flashing lights or light sticks are used to give each other light shows. Small battery massagers are used for the sensation they produce. Ecstasy will cause tooth grinding so mouth guards, lollipops or pacifiers may be used to reduce the effect. Drug clothing. Many items of clothing are now produced with hidden compartments for holding drugs. Inside the band of hats, in the side of sneakers, in the inside leg seam in pants or shorts or in the hem. Clothing with logos or motifs indicating drug use is common especially among the Rave crowd. 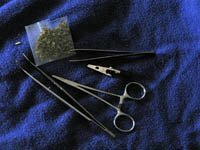 Have you found something that looks like drug paraphernalia but you are not sure? You may contact me and give me a description of the item(s) and I will attempt to get an identification for you. This is a free service and you are not obligated to buy anything or use my coaching service. I have noticed a big increase in the number of questions I am getting regarding possible drug paraphernalia, and many of these are queries about odd things, i.e. plastic tube, bent spoons, tea balls, washers, rolls of foil etc. As I usually explain when I reply, drug addicts are an inventive lot! Things are often used to (a) Make it look like the item is NOT drug related, or (b) Find a new way to use the drug or substance. You can check out my information on drug addiction signs to become more familiar with what to look out for.